Students for a Democratic Society at the University of Minnesota stands in solidarity with the people’s uprising in Baltimore as they demand justice for Freddie Gray. 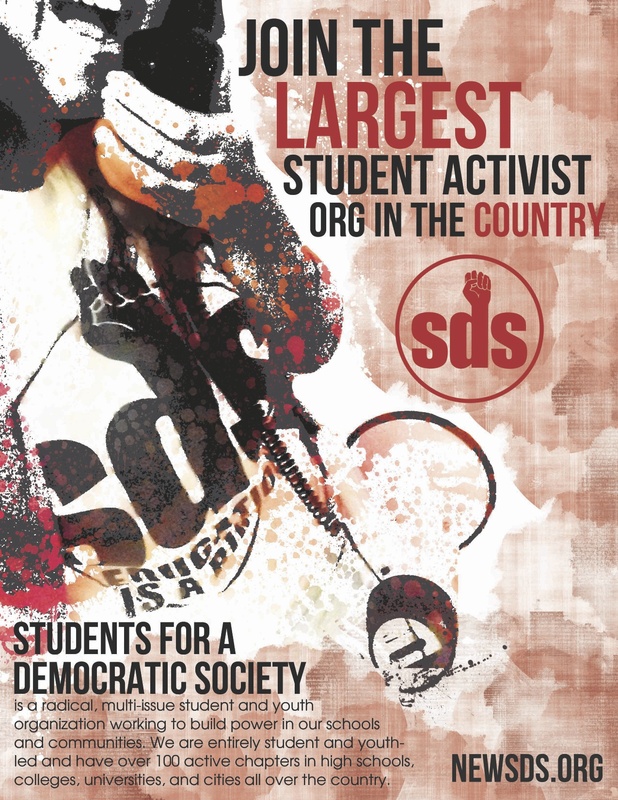 UMN SDS stands against police repression and militarization, particularly in its manifestations as brutality, racial profiling, and enforcement of white supremacy. The uprising in Baltimore highlights the extreme emergency situation of oppressed nationalities in the United States and demonstrates the extreme measures to which people living in Baltimore will bravely go to take back their streets, in a sustained series of protests that have yet to cease. Baltimore police officers tackled Freddie Gray and took him into custody on April 12. In the process, police crushed his voice box and nearly severed his spine breaking it in 8 places. Police then waited nearly 40 minutes before calling for medical attention. Gray died a week later from his injuries. This act must be seen rooted in the routine everyday practices of the status quo across the United States. Local, state, and federal law enforcement units have consistently stolen the lives of innocent Black, Latin@, Indigenous, Asian, and other oppressed nationalities in the States. Amongst those that have stood out the most over the past few years leading to ongoing protests are Derek Williams and Dontre Hamilton killed in Milwaukee, Eric Garner in New York, Michael Brown in Missouri, Walter Lamer Scott in South Carolina, 12 year old Tamir Rice of Cleveland, Rekia Boyd in Chicago, and the homeless James Boyd in New Mexico. These are only a few names amongst many that have been caught in the spotlight of criticism and dissent. However, far less frequently reported are the deaths of women and trans women of color, such as Mya Hall, who hailed from Baltimore, who like Freddie Gray was also killed by police. Racism and violent brutality doesn’t start or stop with the police; their racism is rooted in the racist institutions, structures and history of the United States. Racism which continues to segregate housing in cities across the United States. Racism which leaves our schools more segregated than before Brown v. Board of Education. Racism that saturates the courts and manifests itself in the ‘legal’ system in the form of mass incarceration, disproportionate sentencing for people of color, routine and systematic harassment, and the abuse of power like that seen at Homan Square in Chicago. The media also fans the flames of racism by distorting and routinely overlooking and excusing the murders committed by police and vigilantes. This was transparent in the case of Walter Lamar Scott whose case was nearly overlooked as another “routine” killing of a “dangerous” suspect by police, reported by local news without much notice until a video surfaced documenting his being shot in the back as he fled from officers. More examples can be seen daily in the smear campaigns against the protesters demanding Justice for Freddie Gray. The media has constantly been shifting attention away from the damaged spine of Freddie Gray and instead has focused on the damaged private property of Baltimore. The media has refused to acknowledge the vast economic and social disparities in Baltimore, just 40 miles away from the heart of the United States Capitol but instead has branded protesters with veiled racism like “thugs.” The media has excused the police repression carried out by the Baltimore Police and other local law enforcement, reassuring the white middle class viewers that their opinion about the police and their brutality against people of color are just a “few bad eggs” and do not represent any kind of systemic injustice or oppression. University of Minnesota Students for a Democratic Society stands with the people of Baltimore and oppressed people across the United States in their struggle for liberation and justice. 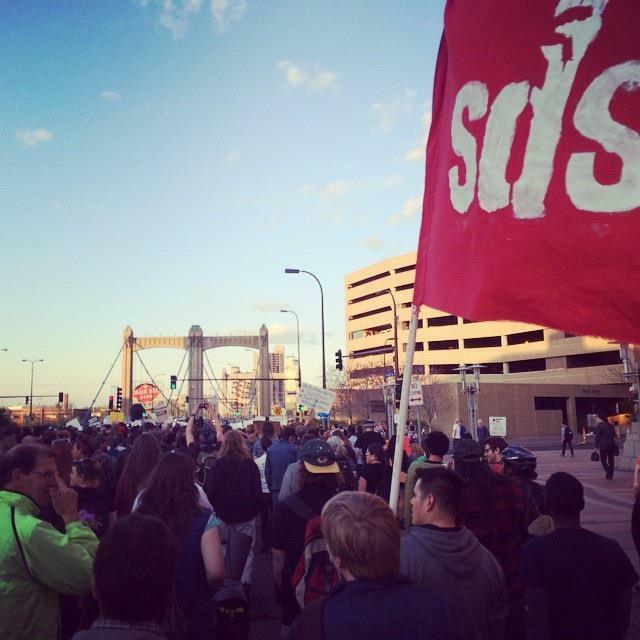 UMN SDS condemns racism, police repression, brutality, and mass incarceration. People of color have the right be free from and to resist oppression, exploitation and white supremacy in all forms. Students for a Democratic Society and its affiliates stand in solidarity with political prisoner Mumia Abu Jamal, who is the victim of attempted execution through medical neglect and malpractice. An acclaimed activist, author, and revolutionary journalist; Mumia went into diabetic shock on March 30, with no past history of diabetes. Hospitalized for two days, Mumia was then transferred back to the prison that failed to diagnose his illness. With a dangerously inadequate diet and health that deteriorates each day, Mumia’s well-being is being deliberately sabotaged. As the state’s two past execution attempts were foiled by international pressure, SDS recognizes this medical mistreatment as another attempt on Mumia’s life. This timing is not accidental. The attempt to silence Mumia comes during waves of racial unrest across the United States. 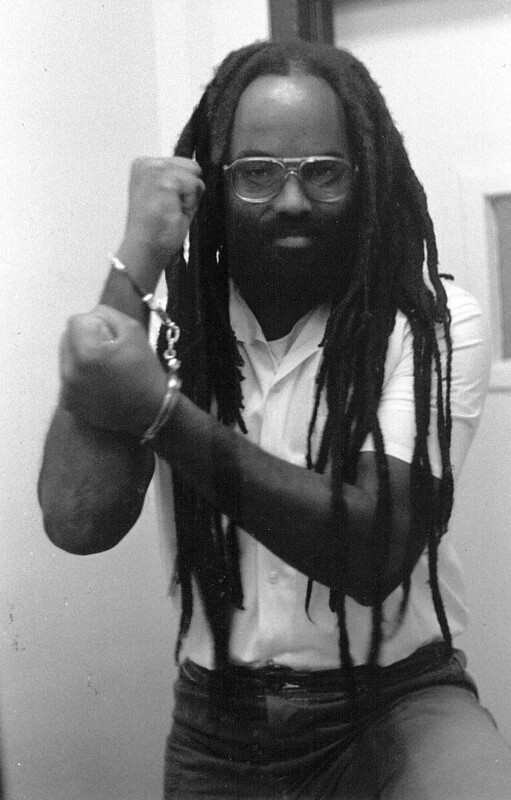 Mumia Abu Jamal is an uncompromising advocate of racial and social justice who continues to inspire activists to fight back against oppression. The United States’ system of white supremacy cannot allow revolutionary figures like Mumia to voice their dissent to the constant reign of terror inflicted upon the black community. Mumia’s prison doctors claim to be unable to identify the cause of his illness, which leaves his skin blackened and swollen and causes him severe pain. Despite their failure the prison doctors refuse to allow outside medical professionals or diabetes specialists to attend to Mumia Abu Jamal. Each day Mumia is refused proper medical attention brings him closer to death. SDS holds the Pennsylvania State Correctional system complicit in this attempted murder of Mumia Abu Jamal. Mumia Abu Jamal is one of many political prisoners, like Chicago activist Rasmea Odeh, currently facing repression from the United States’ government. It’s important that we stand in solidarity with our friends in the struggle. The United States must stop its brutal repression tactics, and free all political prisoners! We demand an end to this medical murder. SDS stands with the family of Mumia and his supporters around the world as we call for his release in order to receive proper medical care. 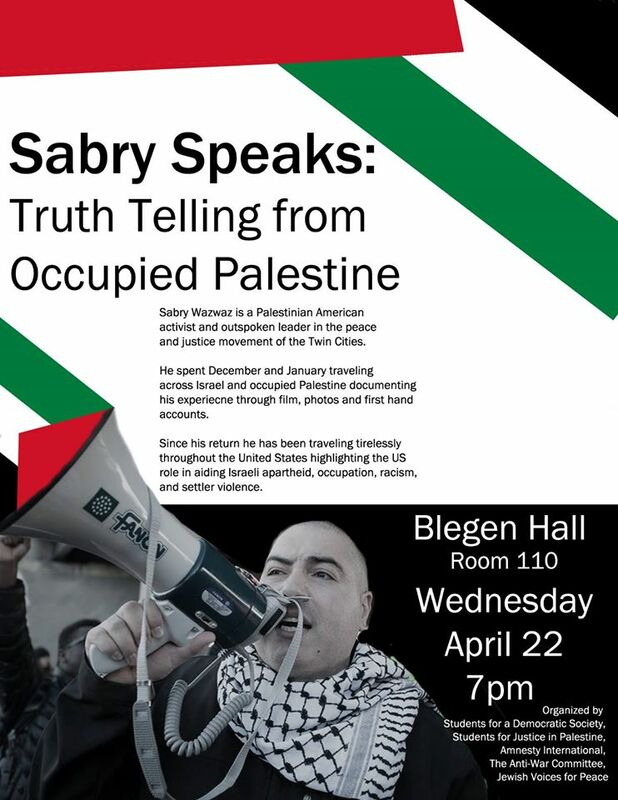 Join SDS, SJP, Amnesty International, Jewish Voices for Peace and the Anti-War Committee in Welcoming Sabry Wazwaz to the University of Minnesota where he will share stories, photos and videos from his travels in the occupied Palestine. Sabry Wazwaz is a dedicated Palestinian American activist and outspoken leader in Minnesota’s peace and justice community. He has spent years in the movement for a free Palestine and has been active in the #BlackLivesMatter movement; with which he helped shut down Interstate 35W and participated in the numerous other peaceful protests and demonstrations including the rally at the Mall of America which has now seen 11 activists come under local government repression for their organizing. In December and January Sabry spent more than a month traveling in Palestine, returning to Minnesota with extensive videos, photos and first-hand accounts of life in the occupied West Bank. Since returning he has traveled across the United States advocating for Palestinian issues highlighting Israeli crimes against humanity, racism and systematic brutality against Palestinians and immigrants. He documented the dehumanizing military checkpoints restricting movement of Palestinians, the violence of Israeli settlers stealing Palestinian land against International law, the racism of Israeli apartheid laws, the massive apartheid walls being erected to divide the landscape and carve up Palestinian territory, the Jewish movements of peace and justice in Israel and abroad, and the ongoing denial of the right of return of Palestinians to their homeland. 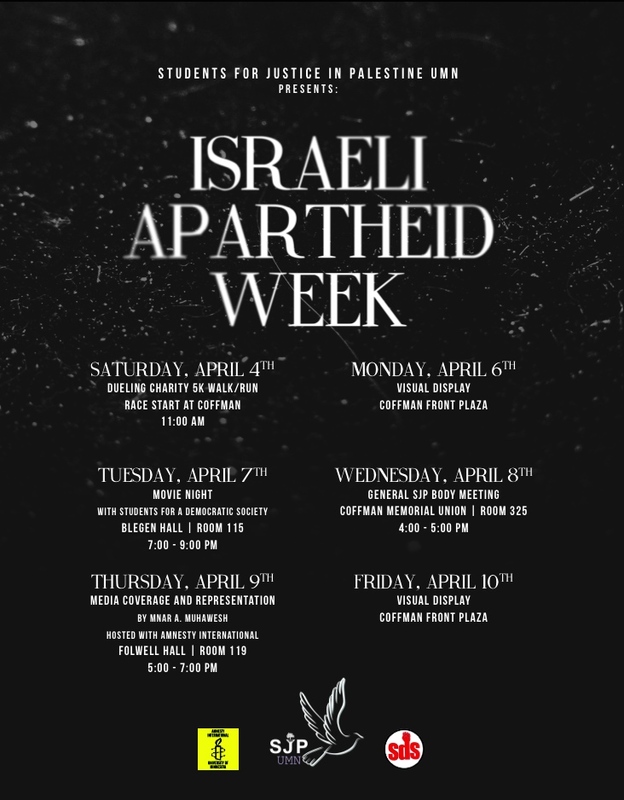 The event will be held in Blegen Hall, Room 110 on the West Bank of the University of Minnesota on Wednesday April 22 at 7pm. Join Students for a Democratic Society at the University if Minnesota as we welcome our dear friend, mentor and fellow activist Sabry Wazwaz to campus. 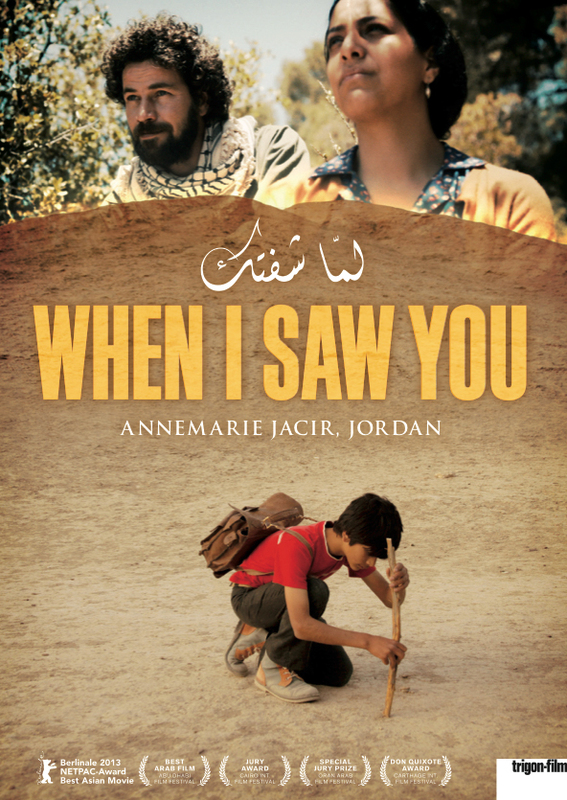 Join SDS and Students For Justice in Palestine on the University of Minnesota West Bank in Blegen Hall 115 for a screening of the award winning 2012 film ‘When I Saw You” at 7pm this Tuesday, April 7. 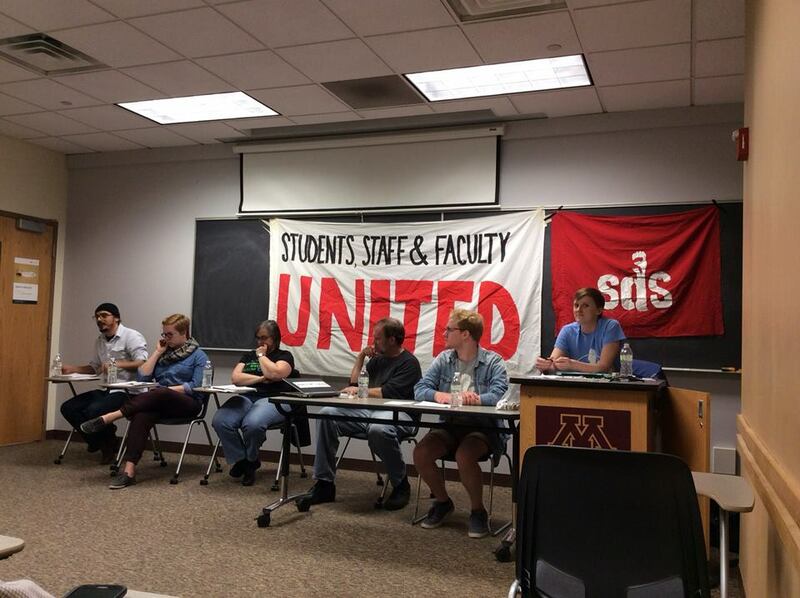 On the evening of April 2, 2015 students, staff and faculty of the University of Minnesota gathered on campus in Ford Hall for The People’s State of the University. The Peoples State of the University was held an hour after the carefully scripted university’s State of the University address given by President Kaler. In his PR driven script Kaler maintained his typically vague language and claimed credit for much of the hard work done by students, staff and faculty at the university to achieve meaningful and progressive gains over the past year. Kaler also laid the foundation for hard hits to students in the form of a tuition increase when, in his prepared remarks “We will probably get back to a period in which we have relatively modest 2 or 3 percent tuition increases,” after highlighting “his” great accomplishment of a tuition freeze over the past two years. The real source of pressure to hold the line on tuition came from SDS in the form of years of resistance and demands to end the increases to tuition and cut administrative spending. These efforts culminated in a 2013 all campus election referendum that passed overwhelmingly by over 85% that demanded an end to tuition increases, a cut to administrative bloat and an reinvestment in the educational mission of the university. While in 1993-94 tuition was $3,421 it has skyrocketed to $13,626 today, an increase of 143% after adjusting for inflation. While Kaler has insisted, like many administrators, that the source of this rise has been state or federal spending cuts a recent New York Times article highlighted the source that SDS has been citing all along with its allies- bloated administration. In the wake of a damning report from the Wall Street Journal last year, which cited the University of Minnesota as the most over administrated university in the United States, the New York Times article highlights, “a major factor driving increasing costs is the constant expansion of university administration,” adding that between 1975 and 2008 there was a 221% increase of administrative roles. The Wall Street Journal cited the University of Minnesota as having the most excessive spending on administration but it also highlighted the same facts pointed out by the Times regarding the outrageous ratio of administrators to students, staff and faculty. Thus what Kaler is suggesting the university has to “get back” to is a tuition rate that increases at double the rate of inflation and that in total will double every decade to fill he and his administrators pockets with more money. President Kalers carefully scripted State of the University also used buzzwords and elitism to entice corporate investors and big money donors while ignoring the impact that it has had on education at our states major land grant public university. For example President Kaler proudly stated that “we must intentionally reject complacency about diversity and campus climate,” but in doing so neglected acknowledging his own “ntentional efforts to avoid meeting with and engaging in meaningful dialogue with students of color in the ‘Whose Diversity?’ collective when they occupied his office after months of administrative negligence and rejection. President Kaler also tried to claim that it was born of his own efforts to remove “some” racial description from crime alerts, suggesting it was at an open public meeting over “six months ago” that a few students addressed the issues for the first time with him. The PR machine even adopted two students to grant credit to while neglecting to mention the demand was risen over six months ago in a set of demands authored by ‘Whose Diversity?’ which was delivered to administrators well over six months ago. President Kaler also failed to mention his efforts to create an inclusive and diverse environment on campus include cutting the Chicano/Chicana Latino/Latina Studies program. Cutting ethnic studies programs that were waged through student led struggles historically can help white wash and strip the power of students to have a meaningful voice in creating a truly inclusive, inviting and democratic environment where student needs come over administrative greed. Finally President Kaler “recognized” that research ethics at the University of Minnesota are “a problem,” for the first time after years of vocal criticism from professors like Bio-Ethics professor Carl Elliot and many other student and community voices. There remains much to be explored and unveiled in terms of extensive conflicts of interest between research at the university and private pharmaceutical companies who help the university conduct research. A systemic failure like this can only be the result of institutional corruption, negligence and deceit from the highest levels. Accountability must come down on the medical research programs as well as the President and the Board of Regents who have continued to ignore, deny and categorically cover up the scandal for years. The time has long since passed for change at the University of Minnesota. Students for a Democratic Society will continue to demand justice and accountability. We say “Education is a Right!” There is no more time for empty rhetoric, PR campaigns or cute photos of administrators with students and staff that they systematically extort in the name of education. Join us in our struggle for justice and education!